The moment a tiny emerald tree monitor lizard first broke through its shell at Bristol Zoo Gardens has been captured on camera. 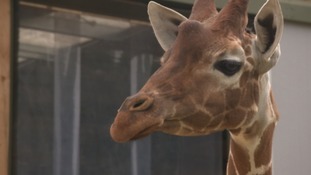 The four-year-old giraffe suffered from an extremely rare blood condition. Keepers at Bristol Zoo say it has only recently become apparent that the young gorilla is a female. Mike is a 20-year-old Aldabra giant tortoise, weighing 83kg and joins the Zoo’s other tortoises Helen, Twiggy and Biggie. On of Bristol Zoo's most celebrated residents turns 10 today. Touni the gorilla first arrived at the zoo from France two years ago. Western Lowland gorilla Salome was found this morning in the gorilla house by her keepers.